Adrenaline flows from the minute I wake up. As soon as the alarm goes off I remember why I have set it for 7am on Good Friday when I should be having a well earned lie in. As I felt pretty good running the Trafford 10k I decided to keep to the same ritual that I undertook for that race. I had a slice of toast, cup of coffee and a berocca before I set off. The sun was shining and the birds were singing, so I figured it may just be a scorcher of a run this morning. Putting on my new running shorts, t-shirt and the new investment of Nike trainers, I set off for race number 2 of my trilogy. I arrived at the sports village and queued up for my race number 950. I started to feel very slightly nervous as my greatest fear in my racing life is being last. I know that someone has to come last, there is no shame in being last but its not something I wish to experience in a 10k race. So, another dilemma for me. Do I run with my camel-back on to keep myself hydrated or do I chance it without. I wanted to try and run without it as many a run at home I have barely touched the water during that distance. It is more of a comfort thing for me as I have only ran twice without it and both times I felt like an item of clothing was missing. However, I decided to rely on the water station and left the camel-back in the car. 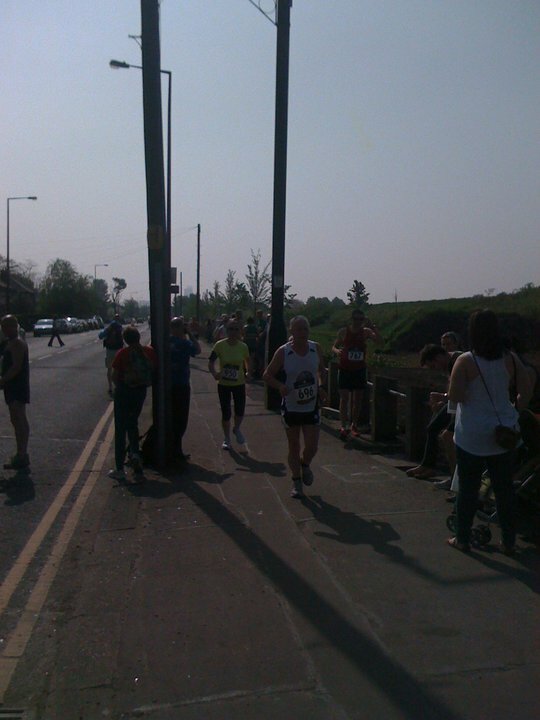 I made my way up to the start line with the other runners. I felt exhilarated……..I really enjoy the buzz of starting a race, and started a bit further forward than I did for my Trafford 10k as I didn’t want to get caught up in too much traffic. It was getting hot and I immediately regretted not carrying my camel-back especially when the route took us through a dusty industrial estate. I could get through it though – only five miles to run and then stop for some water. I felt really good during this race, not a sign of cramp, knee pain or any aches in my back. The new trainers felt good too – my toes felt spaced out and every step was cushioned, instead of feeling every pace shoot through my body. I gained a lot of momentum at the half way mark. Firstly I got to hydrate, although I really don’t like throwing plastic cups on the road and do look for bins first. Secondly, I saw my husband and sons waving and yelling me on. That was a real boost. I think my speed picked up from 9:24 to 8:45 for a couple of miles. I finished this race in 54:35 minutes which was a minute and twenty seconds faster than my previous 10k. My next race is the Great Manchester 10k in May. That will complete my fund-raising trilogy, but is only the start of my distance running. I cannot believe I have caught the bug. It was well worth getting up early for on the Good Friday!! 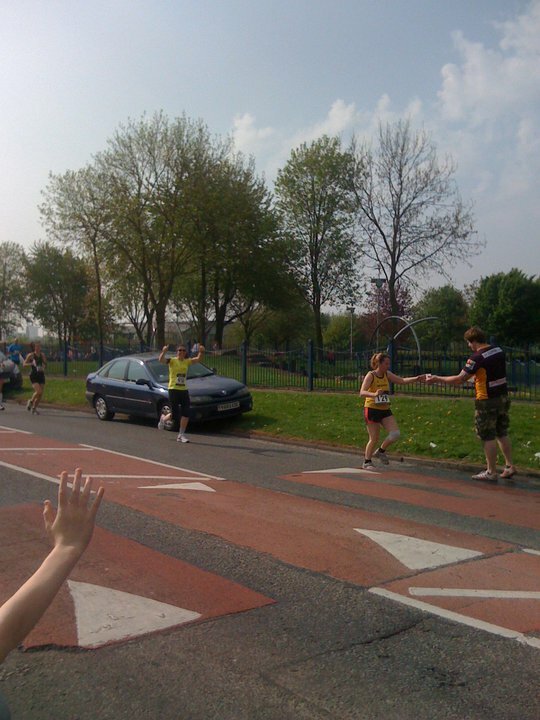 This entry was posted in Manchester and tagged 10k, Manchester, Racing, Running.